Fix a Leak Week ~ March 18-24, 2019 - RJ Kuhn, Inc. 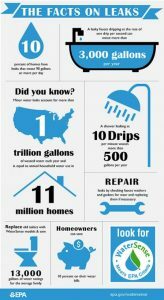 The average household’s water leaks can account for nearly 10,000 gallons of water wasted every year and ten percent of homes have leaks that waste 90 gallons or more per day. Common types of leaks found in the home are worn toilet flappers, dripping faucets, and other leaking valves. These types of leaks are often easy to fix, requiring only a few tools and hardware that can pay for themselves in water savings. Fixing easily corrected household water leaks can save homeowners about 10 percent on their water bills. That’s $1 for every $10 spent on water. All week R.J. Kuhn Plumbing Heating & Cooling, Inc. will feature simple leak fixes you can do yourself. If you’re not very handy, call 630-554-3336 for an appointment with one of our trained professionals.